Last week, I was in Denver for the first-ever Environmental Leader conference, which turned out to feature an impressive roster of sustainability leaders in a small group setting. I chatted informally with sustainability leaders at Toyota, General Motors, RaceTrac, Caesars Entertainment, PepsiCo, 3M, NREL, and more. As at most conferences, the highlights were conversations held outside of the formal sessions, but the content was also quite interesting. My favorite session was a talk given by Dennis Hu of Ball Aerospace, who spoke compellingly about getting teams on board with sustainability initiatives through collaboration and influence rather than edicts handed down from above. You can see many of the presentations and materials from the conference on the Environmental Leader website. 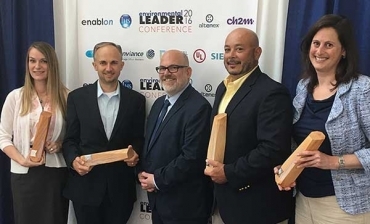 I was also fortunate to represent Powerhouse Dynamics in accepting the Environmental Leader award for 2016 Top Project of the Year, shared with Arby’s, Ecova, and Weathermatic. Together, we figured out how to save Arby’s 7 million gallons of water per year in a pilot of an intelligent water management system, which enabled Arby’s to manage energy, assets, and water from one platform. In order to do that, we fully integrated the Weathermatic intelligent irrigation system into the SiteSage platform. I was thrilled to stand with Paige Janson of Ecova, Brodie Bruner of Weathermatic, Paul Nastu of Environmental Leader, and Frank Inoa of Arby’s to accept the award. You can learn more about the project in our shared press release, and learn more about the work we’re doing to integrate a wide variety of equipment types from different manufacturers into the SiteSage platform right here on our website. You don’t have to be at the leading edge of sustainability like Arby’s to benefit from our Internet of Things offerings!